A few months ago I posted about my desire to rid my cabinets of chemical leeching plastics. I have changed all my plastic baby bottles out to glass, bought new pacifiers, thrown out sippy cups, tried to not heat food in plastic containers, or bought baby food in plastic tubs. It has been tricky, but I think it's totally worth it. I figure if I can do a little and it helps in any way, then it's worth it. I love my glass bottles, but am totally frustrated about Mae getting to the point where she is flinging them around. The only company that makes a silicone sleeve sells them for like $12 a pop...eeek! 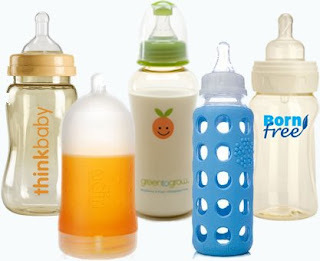 If you decide to do it I recommend getting the Evenflo Glass Bottles from Babies R Us. They are WAY cheaper than all these fancy-schmancy ones. i love that blog site. now i just have to dedicate myself to go fully bpa free. so funny you brought that up. i just read that email you sent two nights ago. and yesterday found something on it on yahoos main page. what kind of pacifiers do you buy? and what kind of cups have you ended up using? i checked all the bottom of my old ones and none of them had the dreaded #7 on them, or pc label. i think theyve all been #5, so thats good--isnt it? #1, #2, and #5 are better. #3 and #7 are worse. I buy Playtex Ortho Pro binkies, but there are a lot of others that are BPA free. I use Munchkin big kid cups or Nuby. That blog I mentioned has contacted all the manufacturers and goes through in detail and photo which ones are free. please keep preaching. I love it. I've been trying to do what I can as well and love learning more about it and what others are using. We went to glass as well. I do get frustrated when people question why I use glass bottles, but I just tell them, I am doing what I can. Don't feel bad about being preachy! I love it and you have brought something I think is really important to my attention. Thanks!